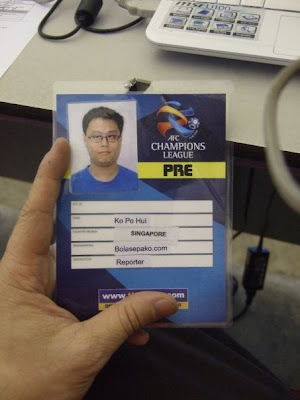 If nothing goes wrong with my media accreditation application to this prestigious Asian club tournament, I should be able to go ahead to do something that mark another milestone of this blog - having an instant update of the ACL Group G fixture between our very own SAFFC and last season's South Korean champions - Suwon Samsung Bluewings. Was told the security measures of this tournament will be much more stringent as compared with other tournaments. 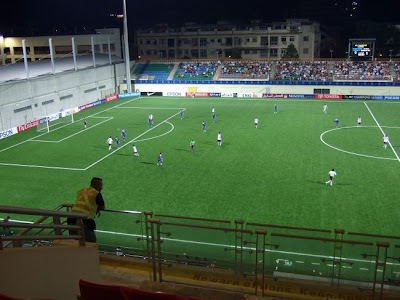 Was told the legendary Cha Bum-Kun, coach of the Bluewings was grilled at the pre-match pressies at the Amara Hotel for the leaving out four key players for this fixture. I guess, sometimes, things must be compromised in tight situation like now Suwon is facing, whose domestic campaign is far from satisfactory and having to cope with a major continental tourney like the ACL, where travelling around the region will be causing unwanted fatigue to whoever is involved (unless one wants to earn some mileages from their flights). 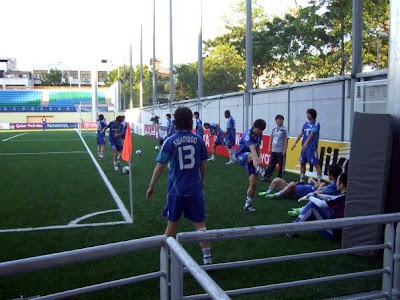 The Suwon players having their preparation as well at the side. 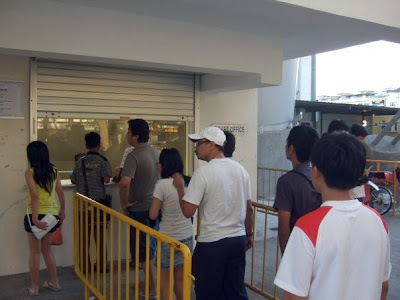 Fans queuing up for the tickets at the South Stand ticket booth. 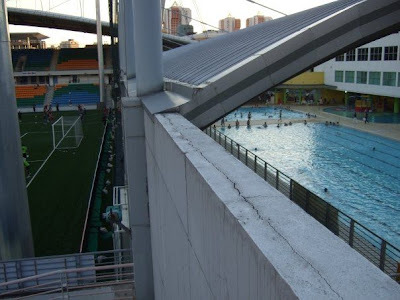 In case the things get hot up, the pool is always by the side. The early birds at the East stand, it's not very often to have this part of the ground open. 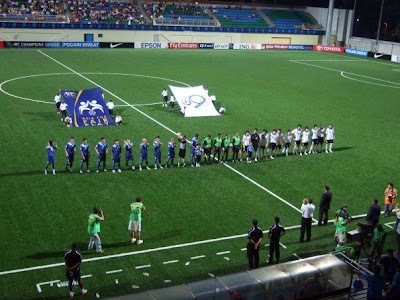 The lining up of the players before the kick-off. 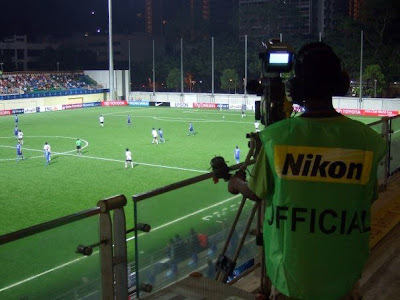 Ten minute into the game saw Brazilian Edu's cross from left found a free Seo Donghyeon but Shahril Jantan got it well covered and forced a side-netting. The Koreans' penetrated well but credit to the Warriors backline who stood well to cushion the onslaught. Thai midfield maestro Therdsak Chaiman broke free of his own and surged pass the porous Suwon's defence but he was well-taken care of at the nick of time in the 38th minute by two defenders. First-half action from the media stand. Took this picture from the stand shortly after the second half started. This match was live telecasted on cable channel. 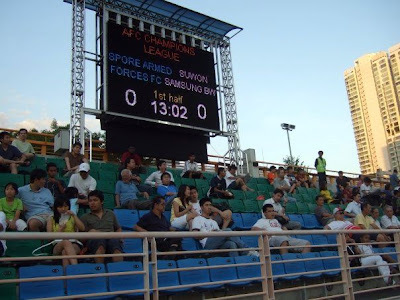 Same "soaking up" tactic continued to work wonder for the S.League champions as they continued to keep the visitors at bay. 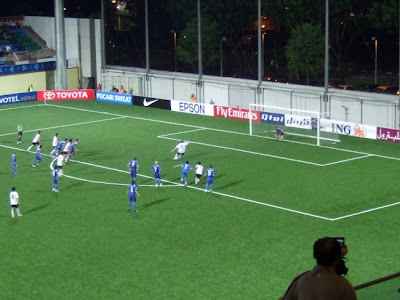 Cho Yong Tae's 59th minute low shot was saved by Shahril, who later denied Baek Ji Hoon's direct freekick from heading towards goal by forced it out for a corner two minutes later. Edu's penalty broke the deadlock in 65th minute. A dubious penalty was awarded to Suwon in the 65th minute saw Edu made no mistake from the spot to give his team a headstart. The Brazilian doubled his tally of the night when he driven a fierce shot that hit the roof of the goal in the 72nd minute. 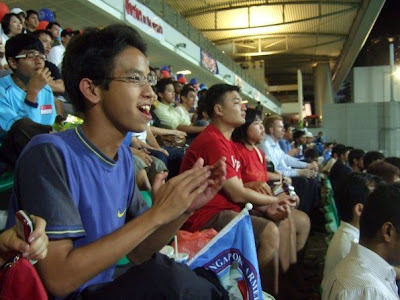 "I thought we were holding them (Suwon) well til that harsh penalty decision that went against us." 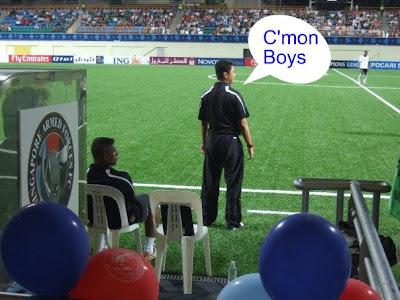 said SAFFC's coach Richard Bok (pictured right, above). "It (the penalty) changed the game a bit and broke the team's spirit but I'm happy for the fact the team gave 100% and played according to instructions. 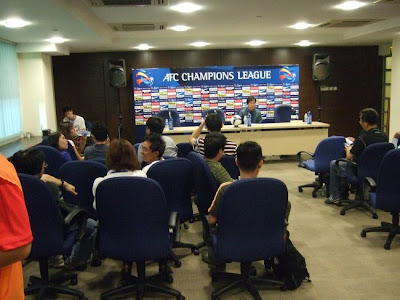 Post-match press conference was held at FAS Boardroom. Section of the media pack inside the room. 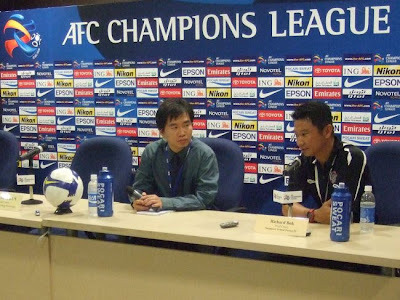 "We have a lot to learn, it's a different level of play in terms of movement and playing of the ball, as you can see Suwon played short, short long passes and Shanghai is known for their built up, which we hope to pick up these experiences from playing in the ACL" added coach Bok. 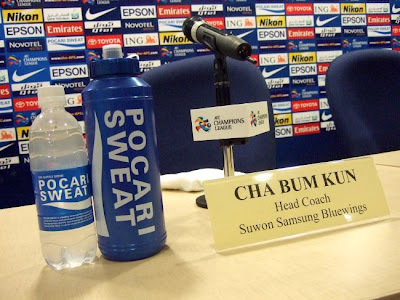 Nothing much from Cha Bum-kun, the Korean football legend and now coach of the Suwon Samsung Bluewings. It's not that the media didn't ask any question but the reply was nothing but centered at these two words - the Weather and the Field. "I'm glad we did not bring six of our senior players as I fear they would be tired out due to the weather and the field." 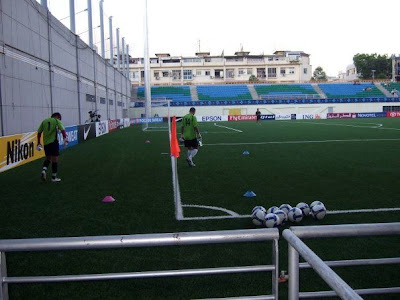 "We felt a bit pressurized, not because SAFFC was hard to break down but because of the weather and the field." 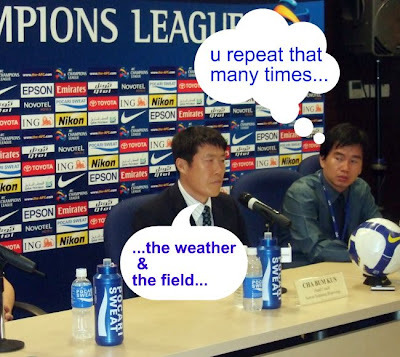 Since coach Cha been talking about weather, had the organizers provided the sponsor's isotonic drink to his team? What an education and some humour as we met the legend that is Cha Bum-Kun..
what lesson had Cha taught us? the skill of "beating around the bush"?? IMO, he sounded belittle the Warriors, who hold them well till the dubious penalty that broke the deadlock..
Well, coach Bok was disappointed with that spot-kick decision, Cha, on the other hand, asked why it was the linesman not the referee who given the decision!! 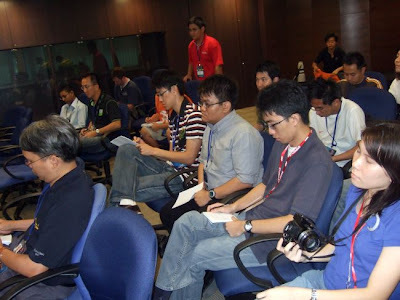 Pohui, hw to obtain press conf pass? Need to hav own compny & got sanctioned by FAS? 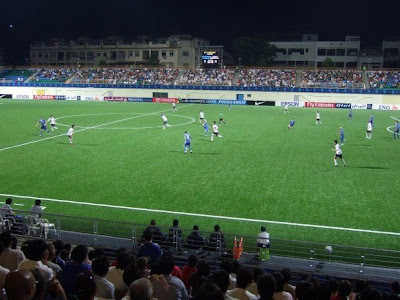 Pass Under AFC, so automatic for FAS & sleague matches too?